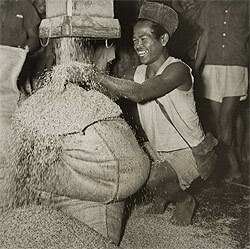 ricehusk.com Pte Ltd is the leading name in global rice husk supply. We specialize in supplying rice husk in every format possible to industrial & retail customers. We work actively with international universities and chemical and manufacturing companies involved in R&D of rice husk uses, and more efficient raw material preparation (micron sizes, densities, fines separation etc). Rice husks are an important source of SiO2, biomass, animal feed and bedding, plastic composite material (WPC), pulp fibre, and soil replacement in horticulture. The range of uses for rice husk is growing every year. A guiding principal of our business is that rice husk is a substitute for something else. Therefore rice husk must be cheaper or more reliably supplied for it to be a viable product. You will find our service and supply reflects this. ricehusk.com Pte Ltd was formerly part of APAC Commodities Pte Ltd. Since June 2013 it is a separate, private business, and continues to be managed and owned by the same people - all of whom have a long history in agriculture, having pioneered the modern animal feed business in Asia starting in 1959 with the Gold Coin feed label. We continue to manage and develop animal feed and agri commodities business worldwide through to today focusing in particular on rice husk and other specialist agri residues.